Recent comments by an Indian Coast Guard official have sparked controversy. The Indian media is currently having a field day with a national security spectacle. Diplomat readers may recall reports on New Year’s Eve of a Pakistani boat blowing itself up near the Indian coast with explosives that were allegedly being carried on board. The Times of India, in its report at the time, described the incident as a potential attempt to “unleash havoc on Indian shores like the 26/11 terror strikes,” calling the vessel a “terror” boat. According to the initial reports, the boat was intercepted by the Indian Coast Guard approximately 365 km from Porbandar, a coastal city in Gujarat. “The Coast Guard warned the boat to stop but it increased speed and tried to run away. After being stopped, the four persons on board the boat blew themselves up. The boat sank at the spot. Search operations are still in progress,” a source told the Times of India at the time. Reports further noted that the boat was in communication with Pakistan’s military. Recent comments by B.K. Loshali, a senior Indian Coast Guard officer, however, contradicted the official government explanation of that event. 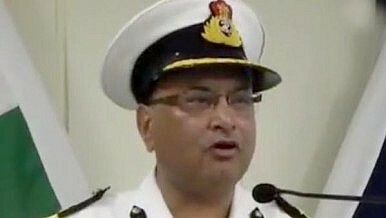 Controversy arose after the Indian Express released a video on Wednesday showing Loshali stating that he had ordered the Indian Coast Guard to attack and destroy the boat. In the video, Loshali says the following [all sic]: “Let me tell you… I hope you remember 31st December night… we blew off that Pakistan… We have blown them off… I was there at Gandhinagar and I told at night, blow the boat off. We don’t want to serve them biryani…” If Loshali’s comments are true, then the government’s account that the boat blew itself up is false. Whatever has been reported… is not factual and I do not subscribe to the text. I have not made this statement. However, I had made the statement that anti-national elements do not need to be served biryani and to be handled as per the law. As a matter of fact, the operation was not being handled by me and was spearheaded by Commander, Coast Guard Region (NW) and ops team being classified in nature, I was not privy to it completely. I reiterate the boat set herself on fire and was not sunk by the Coast Guard. The controversy surrounding the incident following the release of the video has naturally prompted the Indian media and netizens to flirt with the possibility of a conspiracy by the government to conceal that the Coast Guard did indeed destroy this boat under terror concerns. Of course, Occam’s Razor would suggest that Loshali simply misspoke. In any case, until the government releases evidence or shelves the issue as a disciplinary infraction by the Coast Guard officer, the public debate will remain shrouded in the realm of conspiracy. Loshali’s comments and the ensuing controversy will dent the credibility of Parrikar’s ministry. The defense ministry is essentially in a position where it is asking the Indian public to give it the benefit of the doubt over Loshali — a task that’s currently proving to be an uphill climb. How Far Have India-US Ties Come After Two Years of Modi? After two years in office, how far have India's ties with the United States come?